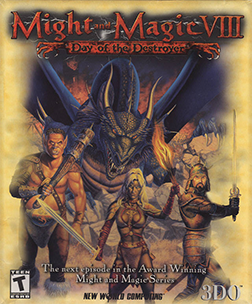 Found one file extension association related to Might and Magic VIII: Day of the Destroyer and 1 file format developed specifically for use with Might and Magic VIII: Day of the Destroyer. Might and Magic VIII: Day of the Destroyer is a role-playing video game developed for Microsoft Windows by New World Computing and released in 2000 by the 3DO Company as the eighth game in the Might and Magic series. The Destroyer is again walking on the Land. The legendary Planeswalker Escaton has been seen in Jadame, and the very elements themselves have felt his presence. Lead a band of rugged adventurers on a most perilous mission. You must save the kingdoms from ruins or watch the lands destroyed forever. Might and Magic VIII: Day of the Destroyer features all new skills, spells, story and dozen of quests and subquests, which make this game completely different from previous Might and Magic games like Might and Magic VII: For Blood and Honor. Create custom characters from a variety of races and classes and combat dozens of formidable creatures as you strive to complete your quest. If you need more information please contact the developers of Might and Magic VIII: Day of the Destroyer (Ubisoft Entertainment S.A.), or check out their product website.